Hutching's Illustrated California Magazine: Sandwich Isles, 1858. [Cheever]: Our Neighbours of the Sandwich Isles. Volume 3 Number 1, July 1858. Hutchings & Rosenfield, San Francisco, pages 203 and 207. 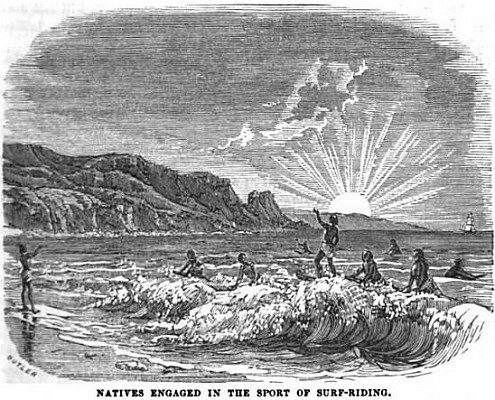 The magazine reproduces the surfing illustration and his report of surfboard riding at Lahania from Cheever's book of 1851. 1851 Rev. Cheever : Surfriding at Lahaina. Extract from Life in the Sandwich Islands, or the Heart of the Pacific, as it was and as it is. A.S. Barnes and Co., New York and H.W. Derby, Cincinnati. 1856. Pages 66 to 69.
over the reef, and to observe there the evolutions and rapid career of a company of surf-players. For my part, I should like nothing better, if I could do it, than to get balanced on a board just before a great rushing wave, and so be hurried in half or quarter of a mile landward with the speed of a race-horse, all the time enveloped in foam and spray, but without letting the roller break and tumble over my head. crested wall that is every moment impending over one, and threatening to bury the bold surf-rider in its warery ruin. wave they rode, and are away outside, waiting for a cruise upon another. Both men and women, girls and boys, have their times for this diversion. visit Lahaina, take a turn or two at this invigorating sport with billows and board. For a more accurate idea of it than can be conveyed by any description, the reader is referred to the engraving. Geoff Cater (2010) : [Cheever] : Hutching's Illustrated California Magazine, 1858.